I enter this year with a long to-do list. I don't make new year resolutions but I've got a whole lot of work to do ranging from my own personal and professional goals to the big picture global stuff I wrap my heart up in. I know most of it won't get done in the next few weeks so I'll try to plug away, a little bit at a time. There's one thing we can all get started on right away though. Let's agree to go about this year with more love and more compassion. With less hate and less fear. What does that mean in practice? I think that can be as small as offering a smile as you hand your credit card to the grocery store cashier. It's remembering that everyone is fighting some sort of battle that the rest of us know nothing about and choosing kindness. It's choosing to think of our neighbors in other parts of the world with compassion rather than disdain and dismissal. 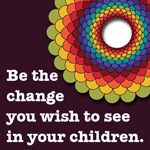 It's remembering that our children are people to be nurtured, not problems to be fixed. It's being gentle with our ourselves when we fail to live up to our own ideals. Go about it however you like, but whenever possible, choose love over fear and all of its ugly derivatives. 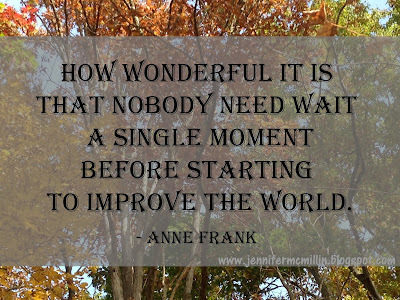 How will you add more love and compassion to the world this year?